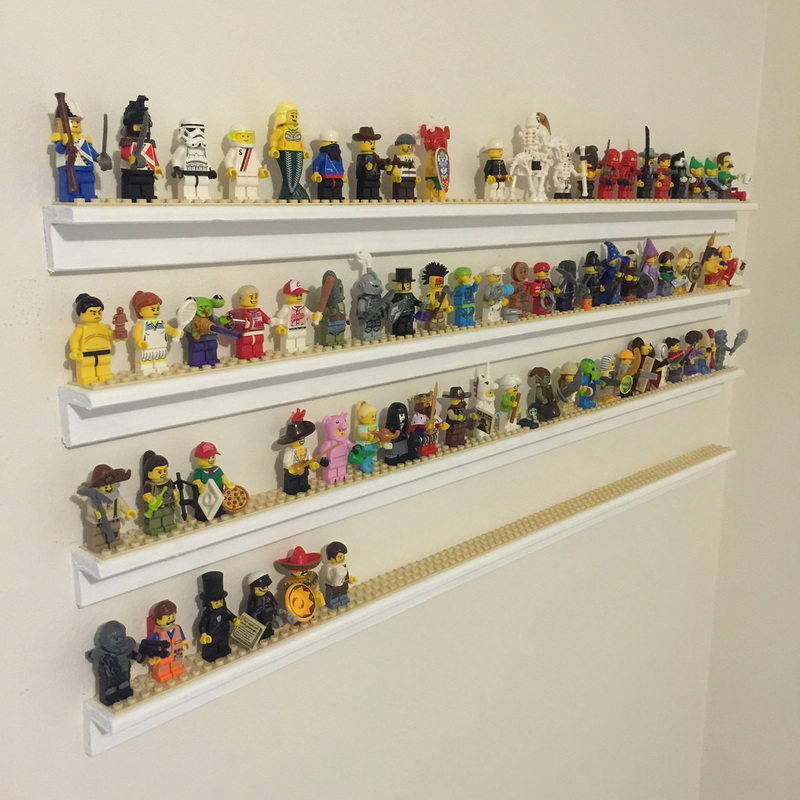 Over the Easter long weekend I was able to build my minifigure shelves. I heard of this idea originally from this post from Jedi Craft Girl. It’s a great idea, but didn’t really work for my house, as it’s brick and mortar, not wood. I had to modify a few things, but the end result is still pretty great! One thing about the moulding first. It comes in lots of different shapes and styles. Plain square ended, quarter circle, triangle, or the one I’m using, L shaped. Choose whatever style you like. It all works the same. Be mindful though, that if you choose a style that’s too thin, you won’t be able to screw it to the wall, and too thin the other way means you won’t be able to secure the baseplate strips to the wood. Once you have chosen your wall and your moulding, you will need to cut it to size. I’ve left around 50mm from the edge of the walls. Once the cutting is done, it’s time to paint. No need for a primer, just a couple of coats will do the job. I did three, as I didn’t like the finish on the second coat. After the paint has dried, you can start gluing the baseplate strips. 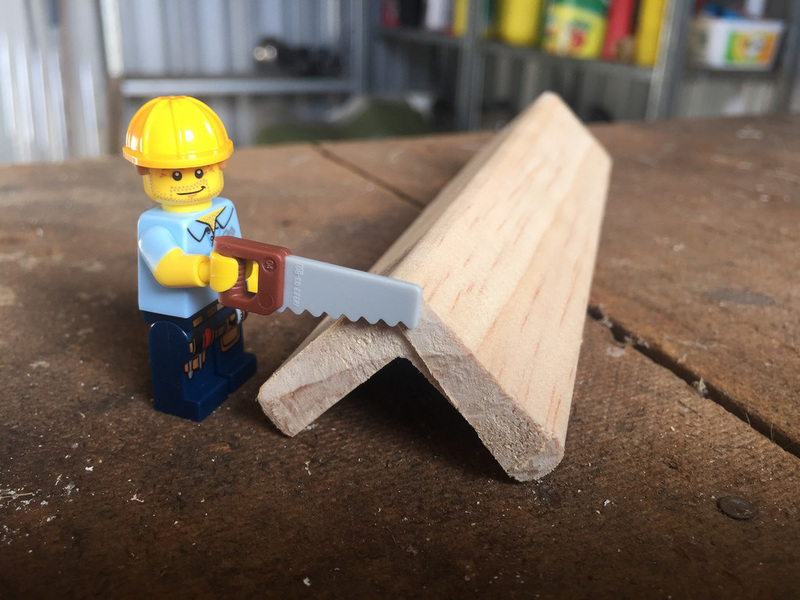 It’s most likely that you won’t use three full strips, so lay them over the wood (I left a 5mm gap at each end), and cut the last one to the right length. Next is to get them in line. What I did was firstly lay them out on the shelf to get the correct length, and to line up the studs. Once in the right position, glue them down by applying a generous amount of glue to the underside. Do this for all the shelves. 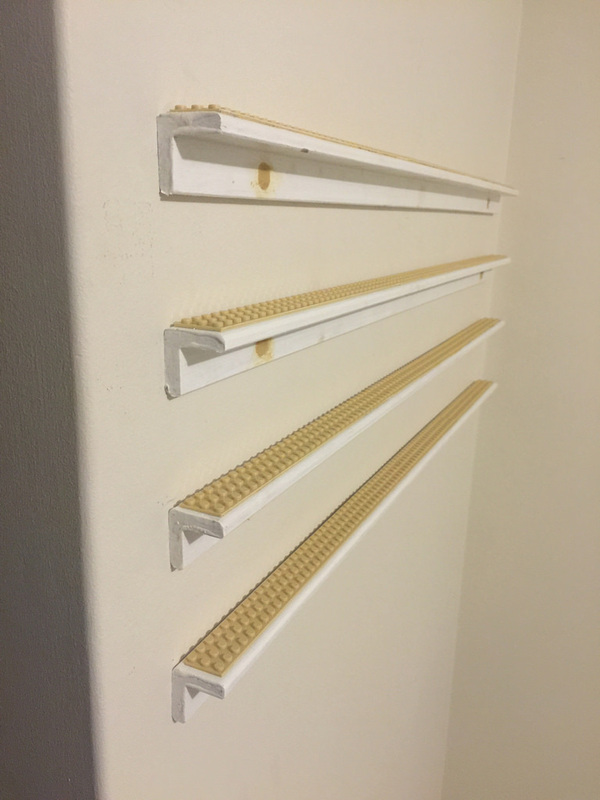 Once the glue has dried, start pre-drilling each shelf. I created six shelves, so it’s easier to do this all in one hit. I measured in around 100mm from each edge so the drill holes were uniform, but you will be covering them with putty and paint after, so feel free to drill where you like! After drilling the hole through the wood (this is for the screw), you’ll need to countersink them far enough so the screw ends up being covered by the putty. Be careful when drilling the hole as the countersink bit is much wider, so you’ll need to measure enough for the countersink bit also. After the drilling is done, you will need to measure up the drill holes for the wall. First, place the first shelf where you want it, remembering to expect collection expansion! I placed my first shelf at eye level. Place it against the wall at the required spot and level it off. Once at the right position, use your pencil to mark the drill holes (mark the spot on the wall through the pre-drilled holes). After marking, use the masonry bit (if your walls are brick) and drill the holes. Hammer in the wall plugs and screw in the shelves. First one done! The second shelf is a little more complicated. 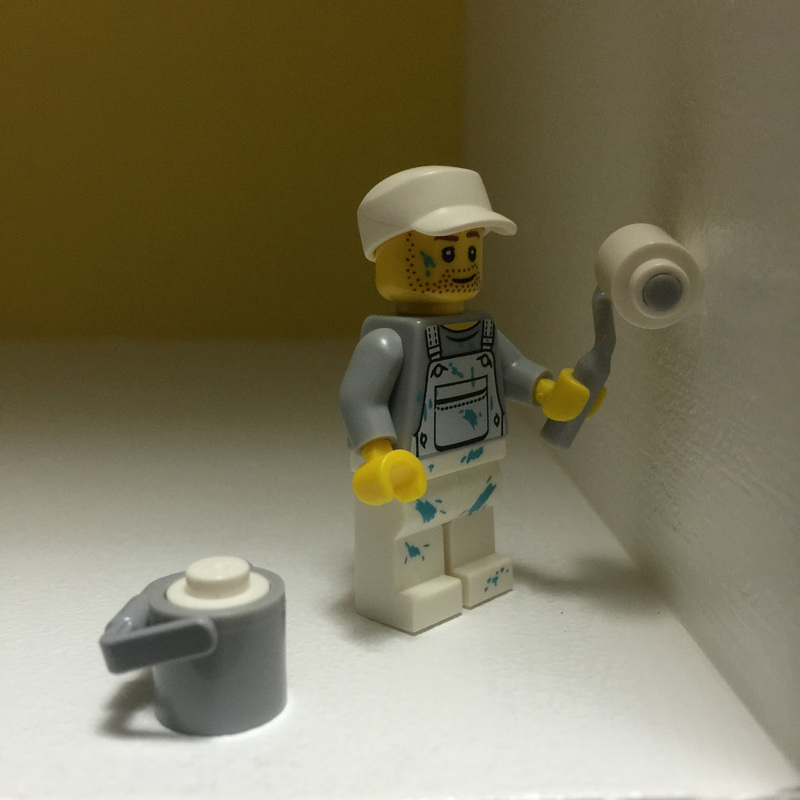 In order to get the right height required for the other shelves, place your tallest minifigure on the shelf and measure from there. With the moulding I used, I left around 2mm distance between my tallest minifigure’s head, so the standard height ones would be perfect. Once it’s in the right position, level it off, pencil in the holes, drill and attach! After all the shelves have been attached, place some putty in the holes over the screws. 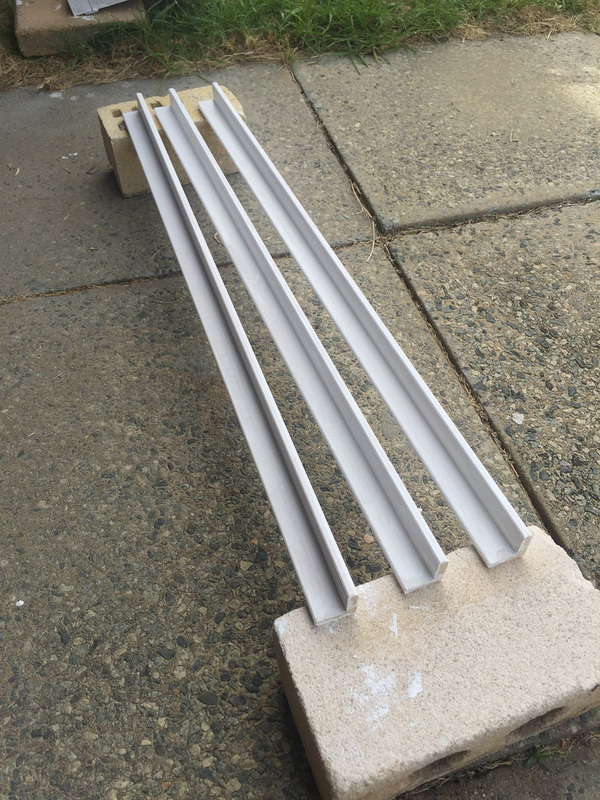 You’ll need to place a little bit more than required, so you can sand it off to smooth. Leave the putty to dry overnight. Once dry, sand it off and give those spots a few touch up layers of paint. The first layer of paint over the putty will be soaked up by it, so just keep going until it’s not visible anymore. 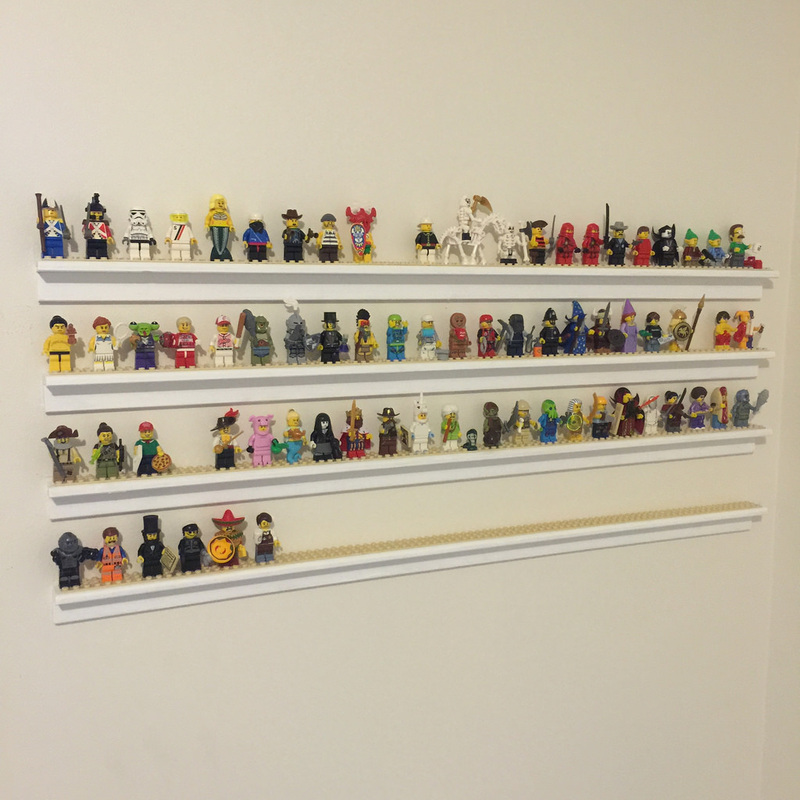 Once that’s done, add your minifigures and admire your work! Thanks again to Amanda at Jedi Craft Girl for the idea!